The theory of "like attracts like" is true for oil cleansing. Oils have the ability to dissolve other oils such as sebum and oil based make-up. Our Facial Cleansing Oil provides a deep cleanse without compromising the delicate acid mantle of the skin and therefore the pH balance. It will wash away impurities while delivering skin loving nutrients to improve the look and feel of your skin and promote a glowing complexion. This blend is delicately scented with therapeutic quality essential oils. It is non-greasy and non-pore clogging. 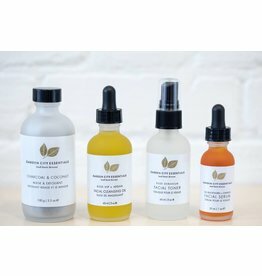 A richly nourishing oil for all skin types, especially high in Vitamin A. Vitamin A is essential to healthy skin to restore and heal. It works on a cellular level to promote higher skin cell turn over rate. A very stable and non-greasy oil that absorbs quickly into the skin. Infused in organic Olive Oil for its nourishing and healing abilities. Calendula soothes and softens skin and has been recognized to have antiseptic, anti-inflammatory, anti-oxidant and regenerating properties. 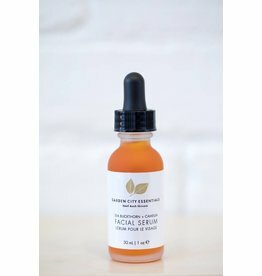 Cold pressed and organic Rosehip Oil is full of vitamins, anti-oxidants and essential fatty acids. Used to hydrate the skin and reduce dark spots, fine lines, scars and environmental damage. Cold pressed, organic and unrefined, Argan Oil is high in anti-oxidants like vitamin E and omega 6 fatty acids. It helps soften skin and maintain a glowing complexion by restoring the lipid layer of the skin and minimizing wrinkles. One of the best essential oils in skincare to rejuvenate skin tone and prevent wrinkles. It smells divine with fresh, citrus, turpentine top notes and sweet, warm wood-smoke, balsamic undertones. Deeply calming and grounding. Dispense 1/2 a dropper of Facial Cleansing Oil into the palm of your hand. Rub palms together and apply oil to face and neck and massage for a minute or two. Steam with a hot damp cloth for 30 seconds to a minute and then gently wipe away excess oil. Repeat if desired. Follow with GCE Facial Toner and Facial Serum. I was also hesitant about using an oil for cleansing my face. Went against everything we have been told! But I am a believer and dedicated user of this product now. My skin thanks me daily. Love this cleanser! This bottle lasts me a really long time even though I use it every night/post workout. I was a little hesitant with the idea of an oil based cleanser. My previous assumptions about skin care had always made me avoid "oily skin". Jolene was very helpful and shared her knowledge about the benefits of oil cleansers. I had been suffering from terrible acne on my forehead and cheeks. I decided to first try the sampler package which include the oil cleanser, and after only one week I noticed a huge change and progress in my skin! I returned to purchase the full bottle of oil cleanser, which I have continued to use every night before bed. My skin has continued to improve significantly and I couldn't be happier! The product smells lovely, and I wake up every morning feeling more confident and happy with my skin. This is definitely a huge part of my skin routine!